I don’t often write personal articles on this blog but one of my New Year’s Resolutions has a lot to do with blogging and the time I spend writing and researching for this blog in particular. You see last year I sold a business I had been running to concentrate on interiors writing and from that moment on I found I was spending more and more time at my desk. I even had a desk makeover so I had a prettier space from which to write. But after being so active in my previous job, I’ve found the sedentary lifestyle of a blogger hard to adjust to. My body is starting to creak and ache on a regular basis so it’s time I became a little more active. Before Christmas I started walking a lot more and even lost a few pounds but after the festive period that good work has all be undone. So my New Year’s Resolution is to get active and work this into my week in a natural, realistic way. I’m going to write a series of posts over the next couple of months so I can chart my progress. Apparently you’re much more likely to achieve your resolutions if you say them out loud, tell people and write it down. It will also coincide with the 20 mile walk I’m doing as part of the Team Honk Blogger Relay, to raise money for Sports Relief. So I’ve got lots of great reasons to be more active over these next few dark and dreary months. 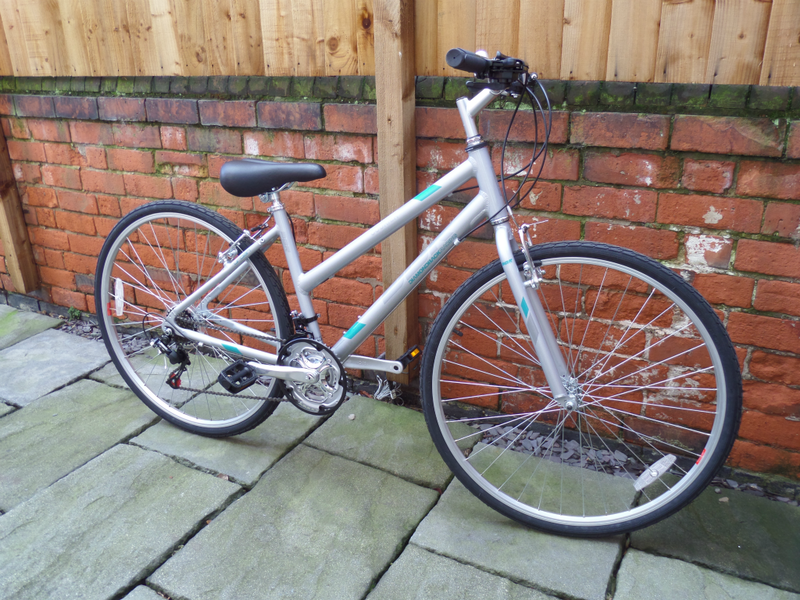 I’ve got my new trainers and a lovely, shiny new bike. I haven’t had a decent bike for years now and find some really hard to ride due to back injuries so this hybrid is just the job. I can be more upright and get the activity that I need. We’ve also got a bike carrier for the car so we can take the bikes further afield and do some riding as a family. Watch this space for news on this but hopefully we’ll get some trips in before we get any snow! Whilst researching the fitness equipment and looking at all of the possible options to help me get more active, I came across this little gadget above, called a Fitbit Zip. I think the easiest way to describe it is to liken it to a high-tech pedometer. Easy to set up and get working, I’ve been wearing it for a week now, monitoring the distance travelled, calories burned and steps taken. I’ve installed the app on my phone and on the pc. With a dongle plugged into the usb port, it syncs automatically whenever I’m close by, plotting my progress on various graphs and tables. I can even tell it about extra activities, water I’ve drunk, food I’ve eaten and even my sleep patterns. All of this information is pulled together to help you see how active you are being. I can tell you the results have been a bit of a shocker! The goal is to do 10, 000 daily steps. On average I’m currently only managing around 6,000 so I really need to up my game. Hopefully, the next time I write-up my progress I will be able to say my steps and activity levels have increased. This is the benchmark, from which I need to improve otherwise that 20 mile walk is going to be very painful. Anyone else trying to be more active this New Year? My New Years Resolution is brought to you in Collaboration with Argos, and all comments and opinions are genuine, honest and my own. ooh I fancy a fitbit zip! V stylish too Good Luck! It really does make a difference when you are blogging. I too, have felt the creaks! Such a good idea getting the bike rack, so you can all get out there, now your girls are older. I can’t wait to start the campaign, my new year fitness posts start tomorrow.